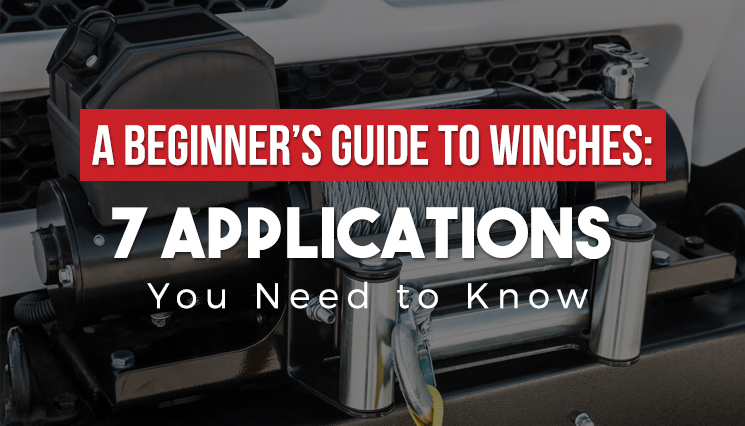 A Beginner's Guide to Winches: 7 Applications You Need to Know | Compresstech Resources, Inc. Whether you’re browsing through winches for sale or preparing for some scheduled cleaning and maintenance, you might wonder what exactly your winch can be used for. There are several kinds of winches available nowadays, ranging from hand-cranked spools to heavy-duty devices wound with steel wire, so you can expect them to have just as many applications. A few of these uses might even prove valuable to you in the future. Here’s a list of 7 applications of winches. ATVs can cross rivers and speed across grassy hills and rocky plains with ease. However, it’s also fairly common for ATVs to end up stuck when tackling muddy courses. In fact, winches are a must-have for any ATV rider who wants to try mud riding. Some ATV brands even manufacture winches that fit perfectly on their vehicles! Once mounted on the ATV, the winch’s wire cord can be connected to a nearby tree or solid object and used to pull the vehicle free. This is also handy for rescuing other ATVs from mud pits and other precarious places or pulling objects toward the ATV. You may have already seen a winch in action on the back of a tow truck. With a winch installed on your automobile, you’ll be able to accomplish similar tasks yourself. These winches can be used to free a stuck car, whether it’s the car equipped with the winch or another vehicle that needs rescuing. They can bring smaller vehicles onto trailer beds for easy transport. You’ll also be able to drag trailers and shift boulders using an automobile-mounted winch. The equipment for automobiles will be more heavy duty than that on ATVs, however. TIP: When purchasing a winch for an ATV or an automobile, make sure that it is actually powerful enough to pull more than the weight of your vehicle! Do this by checking the winch’s rating. The winches for ships are usually of the industrial variety, larger than the winches on cars or ATVs. Crank winches can be found on older ships, being used to raise or lower sail, move a mast, or raise the anchor. These often require much manpower. Meanwhile, an electric winch can bring cargo onto a ship’s deck or to lift the heavier anchors of tankers or industrial vessels. Winches are also used on tugboats and offshore support vessels, which need these devices for heavy tasks such as pulling larger ships and towing hydrophones. While ships will do fine if left anchored at bay, smaller boats may have to be taken out of the water to prevent the growth of barnacles and algae. This also protects them from being damaged by floating debris and other impacts. A winch can help you with this by pulling your boat to the dock easily. You can also use winches on personal watercraft, such as jet skis, to bring them ashore at the end of the day. How can a glider leave the ground if its lack of an engine is central to its design? It takes off by being pulled to speed with a winch. Once the glider is moving fast enough, its specially designed wings generate enough lift to power its rapid ascent. Winches also feature in wakeboarding parks, where they pull wakeboarders off starting docks or out of the water. These devices take wakeboarders to 24-40 kilometers an hour, which is fast enough for the board to slide across the water. One interesting use for winches is for maintaining or felling trees. It can be dangerous to cut a tree down or trim off a large branch without having control over where it will land, especially if the tree stands in a residential area. With a winch, you can tug on the tree or the branch you want to cut so that it falls in a particular direction. Winches are also useful for removing stumps and pulling up trees that have been blown over by storms. Do you need to move generator sets or HVAC equipment around, or pull a brand new motor into position? You can reposition such equipment more easily if you use a winch. Some specially designed dual-purpose winches can switch between modes when they need to move personnel on suspended cradles or platforms instead. This list covers only a few of the more common applications for winches. You might hear of more enterprising owners using their winches to pull fence posts or dry clothes in the wilderness. However, it is not advisable to use a winch as a substitute for a hoist. Winches are different from hoists in that they generally pull heavy objects across surfaces while hoists either lift or lower their loads. Feel free to consult suppliers and other experts who can help you determine the equipment that best suits your needs. This article is the first post in a two-part series covering the basics of winches. The second post will tackle the essential types of winches that you can find on the market. As a leading supplier of industrial equipment in the Philippines, Compresstech provides a selection of world-class hoists and winches and related accessories, as well as complete solutions tailored to our clients. Contact us today to find out more! Found this post informative? Visit our blog regularly for more helpful articles on industrial equipment.